WWAM of the Month: Kristel Ouwehand | WWAM Bam! Kristel Ouwehand will always have a special place in my heart, since hers is the first piece of real, grown-up art I own. She is a Canadian artist, who paints in the traditional Tibetan Thangka style as well as realism with a focus on Buddhist motives . She runs an art school with her Tibetan husband in the Southern part of Gansu province, an ethnically Tibetan region, that is famous for its monastery. If you think that already sounds amazing, just wait till you hear that she spent a decade living in a monastery in India! Kristel really is an impressive example of how life can take you to the most unexpected places. It has been an absolute pleasure and an honour to ask her nosy questions about her personal life. 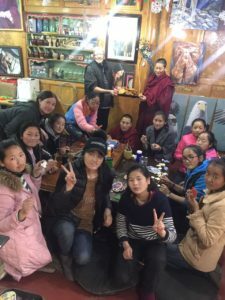 Enjoy her eye-wateringly funny account of what it is to be a WWAM in the highlands of Gansu. Describe a day in your life – what’s your routine? Life here starts around 6:30am when my cats decide they are about to expire from starvation and require instant feeding. Having saved the wee beasts from certain death, I get the coal stoves lit in the bedroom and studio, if C hasn’t already done so. Coffee is next, then breakfast of tsampa (barley flour mixed with butter, dried cheese and tea) or pancakes complete with maple syrup on Saturdays! 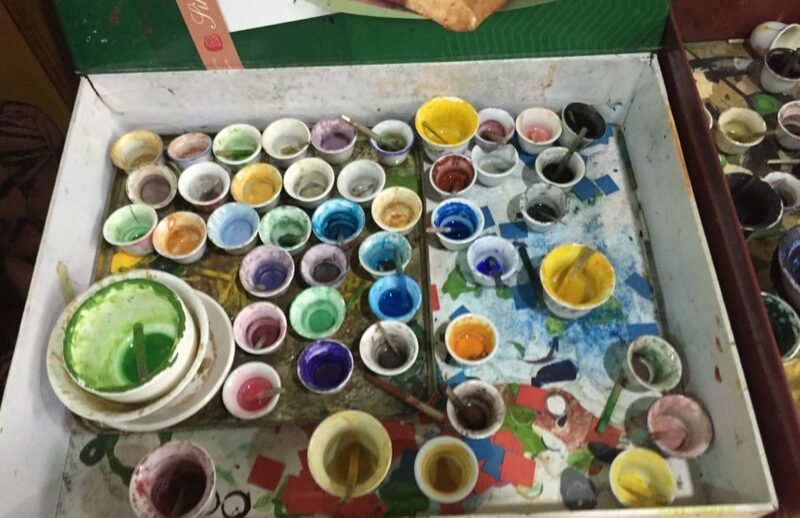 At 8:30, the students troop in, and first order of the day is to prepare the paints – grinding, blending, heating resin, adding water if they are working on a traditional Tibetan thangka. Or, prepping the palette with the colours needed for those working with acrylics. Then we all settle down to our various projects. At 11, two students, depending whose turn it is, go out to prepare lunch, and at 12 we stop to eat noodles, sitting out in the courtyard in the sun. Then paint again from 1:30-5:45. At that point, all the students gather round at the table to show me their work, and we have a group critique session, so they learn how to look at paintings critically. Two students per week are on cleaning duty, and look after clearing up the studio and tidying the courtyard. Three times a week, from 7-8:30 they have English classes, and then I head back to the bed/sitting room with my husband and cats, and have dinner together, then either read, watch a movie or play a game, no using Wechat allowed, for an hour or so. Apart from Saturdays, which is our one day off per week, this would describe a fairly typical day in our studio! What was it that attracted you to your husband? Attraction to my husband was a slow growing thing. I actually had no intention of getting married or being in a relationship. When I first came here, I had lived in a monastery, with 5000 monks for 10 years. That does tend to cramp one’s social life and dating techniques somewhat. My husband’s younger brother was a monk where I lived, and when I moved here, he called his big brother and told him to look after me. So we began as friends, though I found out later, the brother had made me sound like the next Mother Teresa (my husband must be sorely disappointed!) and C had developed a crush on me fairly early on. Due, however, to my virtuous “sainthood” he was too shy to ask me out, and I was oblivious to any signs. So we carried on for over 5 years as friends. Then I had a bad year, a bad relationship, surgery and other such events, and he was so sweet and supportive through it all that somehow things evolved. It was winter when we started dating finally, and when he came to Xining, he was all bundled up in layers of warm underwear. I thought he was a pretty stocky well-built lad, until one night the layers started coming off, and he turned out to be half the size! ;P But by then it was already too late for me, and we got married later that year. The brother was at first mortified, but is now thoroughly amused that he “matchmade” us, as it is not normally an official part of a monk’s job description! What is the greatest challenge of living in Xiahe? There are various challenges living as an expat in Xiahe, one perhaps, is that it is a small nomad town, so there isn’t a great variety of things to do culturally or socially. Another is not having a group of likeminded friends, which, when I was younger, never really bothered me particularly, but now that I have reached the advanced age of 40, it would be nice to have lady friends to sip tea with, while gossiping over our ginger biscuits and flowered teacups. Perhaps not exactly in those words, but my neighbour ladies, though friendly, are all nomads, illiterate for the most part. We got together once or twice, but their conversation topics were beyond my range of experience. I sadly admit to a total lack of knowledge on the finer points of milking female yaks or making butter. And my interests were beyond theirs. Wailing in horror over Trump’s election just didn’t elicit much of a response. So, despite the fact that I am a neanderthal when it comes to social networking, I do really enjoy (and make an effort to keep up with) the WWAM Wechat group, as there is a wider variety of discussions and likeminded opinions on life and cultural experiences. There are many things I love about my life, though it is often easy to forget those, and get bogged down in whinging and complaining. It’s a good question, as it makes me sit down and focus on the good stuff. First, I love the unpredictability. I ran away from home at 17 after having made the choice to travel instead of going to art university, getting a degree, settling down and marrying my then boyfriend, popping out a couple kids and buying a dog called Spot who could then pee on my nicely painted picket fence. Instead I chose to go backpacking, originally planned for a year. That was back in 1992. Never went back. Forty countries and three backpacks later, I arrived here and somehow ended up married, with two cats instead of Spot. I love that life takes me places I had no intention to go. And oddly enough, my life and work is now as an artist, which is what I ran from in the first place. I have wonderful students, and I wake up each morning happy to be doing what I am doing. I am one of the lucky ones in that regard. Obviously it’s not all fluffy white clouds, dancing butterflies and a Disney soundtrack, but at the root of it all, I am lucky to be doing what I am doing. If someone had told you 20 years ago this is where life would take you, what would your reaction have been? Twenty years ago I was in India, and 22 years old. I was a backpacker, footloose and fancy-free, with absolutely no intention of settling down, getting married or owning IKEA furniture. If someone had told me I’d be living here, married to a Tibetan, with a mortgage of responsibilities, I’d have handed them a vodka and suggested they get stuck in. I still find it ironic that I am living high up in the mountains, with freezing cold winters. I am an ocean girl; love scuba diving, swimming and sailing. Tropical sunsets, beaches, monsoons, palm trees and monkeys. Now I live surrounded by towering mountains, the occasional stunted evergreen and grassland full of yaks, while I huddle by my coal stove in long underwear. So. Not too sure what happened with that. What are some of the most serious cultural differences you have encountered? Serious cultural differences, well that could be a book in its own right, I suspect. To name a few, in no particular order: 1. Female rights, or lack of them. I was never really much of a women’s libber until I started living here. Not that other countries are perfect in that regard, but perhaps because I was travelling through, I only really saw the surface levels of those countries. And living in a monastery, well, it wasn’t really a topic that arose on a regular basis. But here, I find the inequality and outdated notions infuriating. Especially with regard to female artists in the art community here. But best I don’t get started on that. Also the expectations of males placed on females in the households. In nomad families, the women do 90 percent of the work. Only now, as girls also go to school, are things slooowly starting to change, but there are myriads of issues connected to this, such as superstitions, health and hygiene… I think honestly, most of the cultural differences I find difficult stem from this one issue. However, I don’t intend to start burning my bras in the street (it’s too cold to strip down to that layer anyway) but I intend to infiltrate more subtly by holding girls’ camps which are all about girl power and health, confidence and creativity. Change the world one girl at a time. What is your approach in dealing with cultural differences? Instead of ranting and raving, although I do a fair amount of that too, much to my husband’s horror – so much for being married to Mother Teresa – it’s better to slowly teach and change through education. But having said that, it sounds like making the rather colonial and patronizing assumption that our way is right and theirs wrong. This is certainly not the case, and I do try quite hard to be open to understanding and accepting cultural differences in certain things. I freely admit though, that I have yet to conquer my dislike for the eating and spitting of sunflower seeds. The trick, I think, or one of them, at least, to a happy cross cultural marriage especially as the partner living in a foreign country, is to prioritize and pick one’s battles. Choose a few cultural differences you really can’t live with and find a way to compromise, and then convince yourself to do the same in return. So for women’s rights, I hoist my battle standard and ride out, trumpets blaring. Sunflower seeds, chewing with open mouths, hollering on the phone, approximate time keeping…. Sigh. Well, I am working on those. Sadly, patience is not one of my virtues. What advice would you give a Western woman looking to date a Tibetan man? For those of you wishing to date Tibetan men, it’s not all about gorgeous tanned skins, high cheekbones and long dark hair blowing in the wind as they ride through the mountains on fiery steeds…though there may be that too! 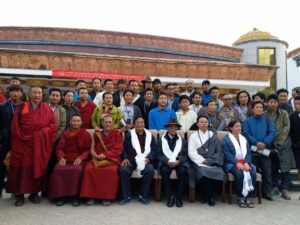 If you are looking for romance and sensitivity, long involved discussions on emotions by candlelight and other such notions – Tibetan bachelor number one, trust me on this, is not the one for you! Having said that, it is unfair the generalize, and my husband did buy me lettuce for Valentine’s Day, which honestly I did find quite romantic, as he knows I love salad (not a real staple in the traditional Tibetan diet of meat, butter, meat, bread and noodles and meat). And one can’t eat roses, right? 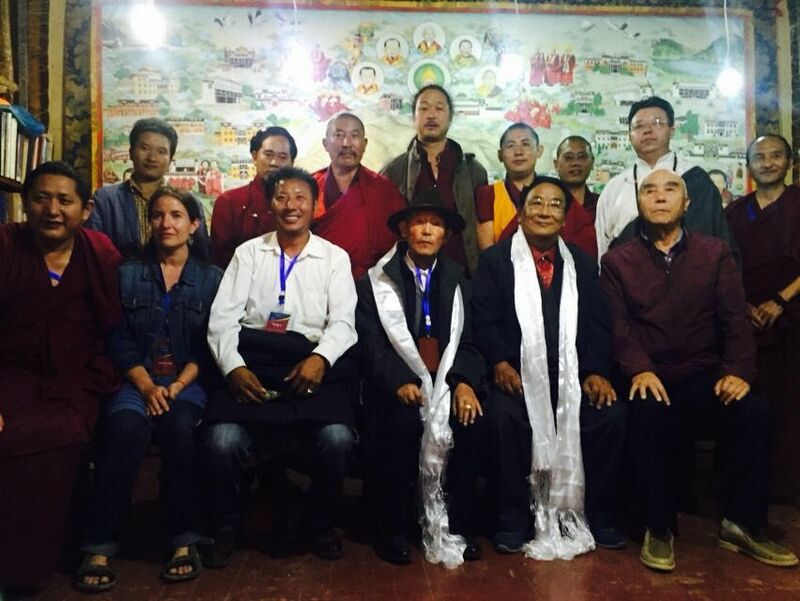 So one does need to be quite strong minded and flexible to be in a Tibetan marriage. My other advice is to find a Tibetan guy who has travelled outside the country at least once. They tend to be more open minded and less tied to local traditions and ways of thinking. Particularly, as I mentioned before, with regard to women’s rights. But once you have those figured out, found your man, it’s a bit like being married to a cowboy who looks like an Indian! With or without the horse. Pingback: Help Save the Snowland Art School | WWAM Bam!